Mold is almost everywhere, indoors and outdoors, in hot or cold environments. Mold spores are microscopic and are picked up and distributed by currents of air, and may enter your home easily through windows, doors, or HVAC systems. Mold spores need moisture to grow. When sufficient moisture is present mold spores can quickly grow into colonies and then spread rapidly. 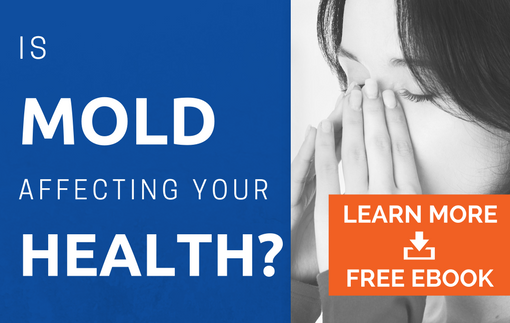 Mold often produces a musty odor. If you have a musty odor you have mold and mildew in your home and you should take steps to have it taken care of professionally. The basic rule is: if you can smell it, or see it, take steps to eliminate it. Mold can grow if the humidity inside your home or basement is outside of the normal recommended ranges. It is recommended that indoor relative humidity is kept between 30% and 50% for the comfort of inhabitants, and also to stem the growth of mold. As for mold, the lower the humidity level, the less likely that mold will be able to grow and proliferate. It is very important that any sources of water or moisture are addressed as a part of any mold remediation plan. Even the best mold remediation cannot guarantee that the mold will not return if there is additional water intrusions in the remediated space. Mold colonies may double in population every 8 to 16 hours if the conditions are right. According to FEMA there is no practical way to eliminate all of the molds and mold spores in the indoor environment. But there are many ways to help control moisture and mold growth in your home. Fix leaks in pipes, and any damp area around tubs and sinks, so that biological pollutants don't have growing environments. Rebuild, or retrofit, with water-resistant building materials such as tile, stone, deep-sealed concrete, galvanized or stainless steel hardware, indoor/outdoor carpeting, waterproof wallboard, water-resistant glues and so on. Prevent seepage of water from outdoors into your house. Rain water from gutters or the roof needs to drain away from the house. The ground around the house needs to slope away to keep basements and crawl spaces dry. Cover dirt in crawl spaces with plastic to prevent moisture from coming from the ground. Ventilate the area as much as possible. Clean fabrics often and keep them dry. Soil promotes mold growth. Consider having air ducts cleaned if you suspect mold exists on the inside surface of the duct or if duct insulation has been wet. Reduce the moisture in the air with dehumidifiers, fans and open windows or use air conditioners, especially in hot weather. Do NOT use fans if mold may already exist; a fan will spread the mold spores. Try to keep the humidity in your home below 50 percent. Routinely check potential problem spots like the bathroom and laundry for moldy odors. ADVANTACLEAN OF FREDERICK IS HAPPY TO HELP WITH YOUR MOLD ISSUES! GIVE US A CALL AT (301) 281-4902 TO SET UP AN APPOINTMENT WITH ONE OUR EXPERTS TODAY!